The non-native Asian hornet, Vespa velutina was first seen in the UK in Tetbury, Gloucestershire, in 2016. Upon sighting, the nest was quickly located and destroyed. This large hornet is a predator of smaller insects, including native bees and pollinators (including bumble bees and solitary bees), and they can cause devastation to colonies of honey bees. Indeed, Asian hornets may build their nests close to honey bee nests, hives and apiaries. Unfortunately, it has been confirmed that a further sighting has occurred in the UK during 2017 in South Devon in the late summer. The Asian Hornet was first seen in France in 2004, and is now apparently widespread in central and southern France. 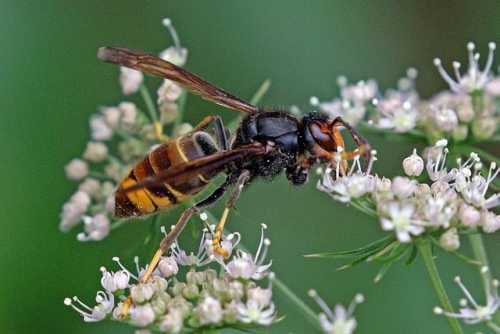 The discovery of the Asian hornet in Devon suggests that a nest may have already been established. If successful, the queen hornet will have laid eggs from which a further 200-300 or more queens may emerge and seek places to hibernate over the winter months. The areas the Asian hornet is most likely to be found in the UK are in southern parts of England or Wales. It is believed that the Asian hornet has arrived in the UK, probably via imports of goods such as soil, pot plants, cut flowers, fruit and timber. The critical time will be in the spring when the new queens will seek to start their own nests, so members of the public are asked to be especially vigilant from spring onwards and report any sightings immediately, preferably with a photograph. Asian hornets are especially active between April and September but may be seen through to November. Government bodies are asking the general public, but especially beekeepers, to be vigilant and report any sightings immediately. 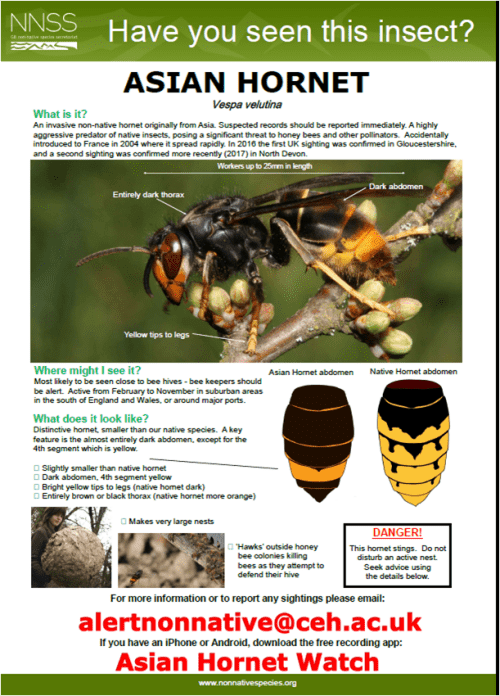 An Asian hornet nest will be removed free of charge from land. Whilst the public (and beekeepers) are asked not to touch an established nest (leave removal to the experts! ), in the meantime, bodies such as the National Beekeeping Centre of Wales, are asking beekeepers to set traps ready for spring, to at least help reduce losses of honey bee colonies.